Last week I shared a video where I made 6 backgrounds using the Heidi Swapp Sunshine stencil, which I keep thinking of as a sunburst stencil. Today, I have a process video and layout using one of my favorite results. 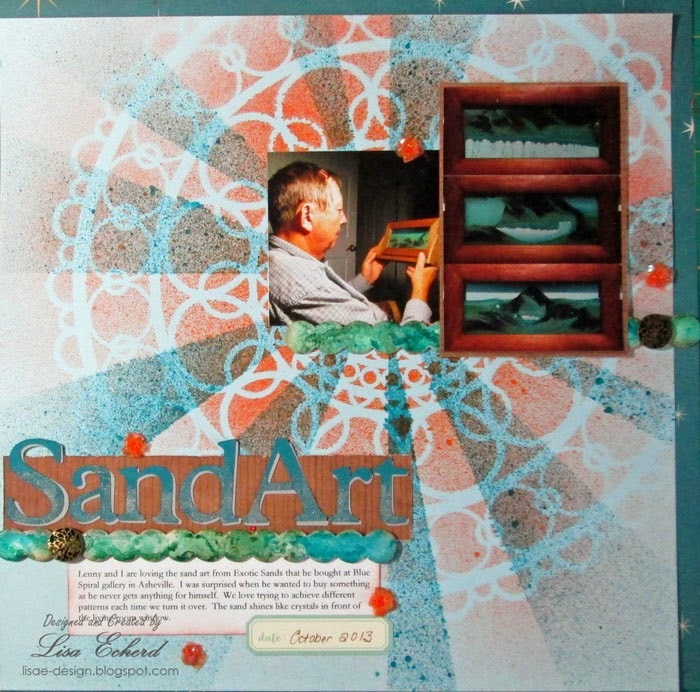 This one was done on Stampin' Up! Bashful Blue cardstock with Mister Huey Honor Society Ink and then the Ring Doily Crafter's Workshop stencil and two shades of orange mist. 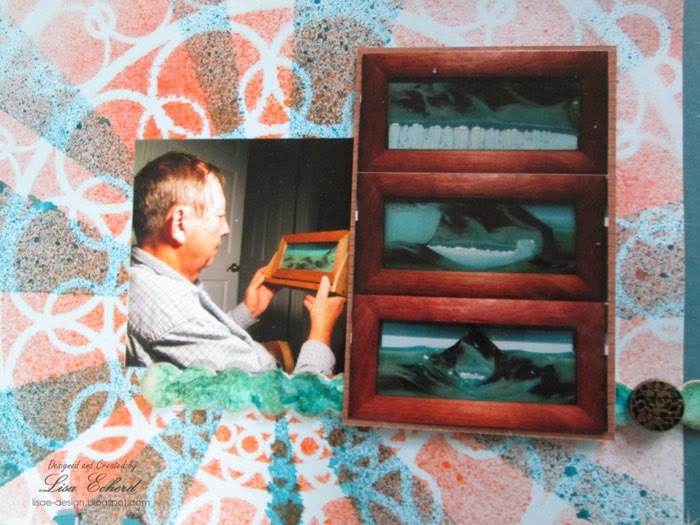 The page is about a decorative piece my husband bought at an art gallery last fall. We enjoy going to galleries but 99% of the time, we are just browsing. This time, he made a purchase which really surprised me. He is very frugal and doesn't really like a lot of things - unless they relate to pinball and then he likes a LOT of things, but that is another subject. 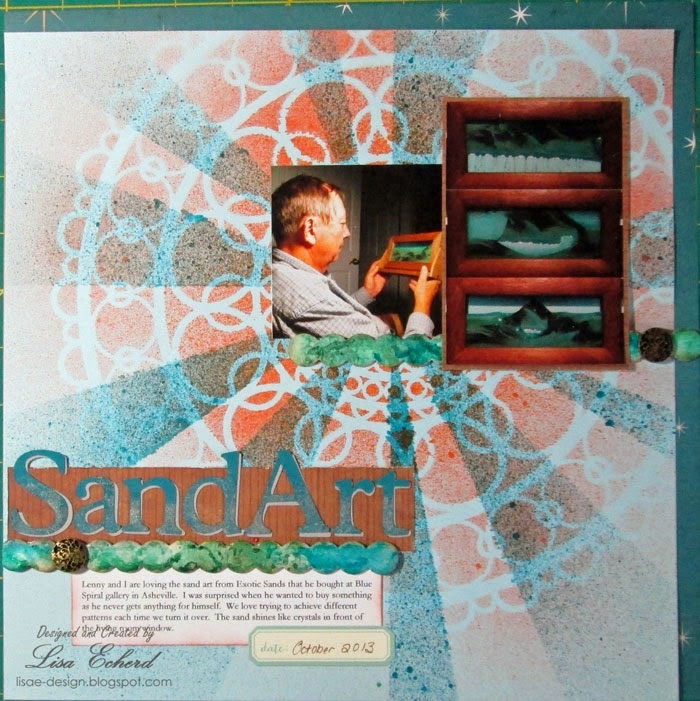 We are enjoying this sand art piece from Exotic Sands. It has several types of sand some of it very crystalized. It makes beautiful sculptures. I took a few shots of one of them building for the layout. 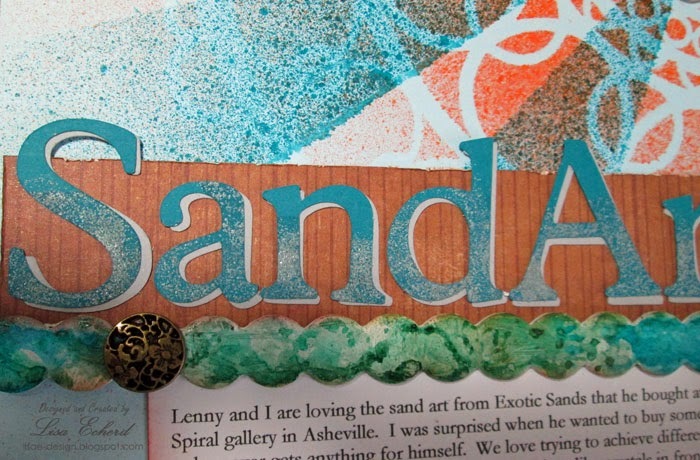 To continue the sand them, I used a textured embossing powder from Ranger on the die cut letters. There is quite a bit of cardstock on this page. The only designer paper is the bit of background you see behind the stenciled cardstock piece. If you have a lot of cardstock and are looking for more creative uses, check out the Creative Cardstock class found here. Now I could use your help. If you watch the video, you'll see me trying to decide if the page needs some little orange sequin pieces cut from trim. Here are two versions of the layout. The 1st one has the addition of the orange pieces. Should I add those or not? I just couldn't decide. I used one of last year's sketches found in the 2013 Sketchbook. The original sketch was one photo and I've used two small ones. Otherwise, I followed it closely. I like the orange pieces on the page, it gives it just a hint more color. Lisa C.
Love the orange sequins! I say keep them. Oh my goodness, Lisa! The background you created with that sunshine/sunburst stencil is absolutely AMAZING!! Great story behind your husbands find, too. Love the way you used the misted background for this great layout. I don't think it needs the orange trim. Wow so very pretty like both but like orange better with bling.